The model of flipped learning has the potential to revolutionize classroom teaching. In this methodology learners are assigned videos to watch before a class. By delivering basic instructions through a flipped classroom video, students are much more informed about the subject before class begins. This makes for a much more engaging classroom discussion, ensuring that the passive learning in the traditional classroom is now replaced by a much more active model of learning. In this blog post, I seek to explain factors you should consider when hosting Flipped Classroom videos. Designing flipped classroom videos is not straightforward. Prior to flipping you need to map out how you are going to be using your video resources, and how the videos would inform your classroom. You would also need to develop a system to ensure that teachers and parents are able to monitor how students follow the video lessons. Tracking how learners interact with the videos is important in making sure that learning from your flipped classroom videos is effective. A custom secure video hosting solution would enable you to tailor your videos and the technical platform for maximum learner engagement. There are a large number of free videos that teachers can recommend to students for viewing in Flipped Learning. Some of the most popular resources are KhanAcademy.org and MIT OpenCourseWare. There are a large number of channels on YouTube offering quality videos for education. Controlling access – You may wish to control access to only the students enrolled in a particular class. Protecting Privacy – You can get students to make videos as part of Project-Based Learning. This encourages an entrepreneurial spirit, as such a project would require them to work collectively and collaboratively through the different stages of video creation. It is necessary to protect the privacy of students making the video. Video Storage in Cloud – If the file is not encrypted, anybody with a publicly shareable URL to the file on the cloud can download without requiring authorized access. Encrypted Transmission – Ensuring that while streaming the videos cannot be downloaded and viewed by unauthorized entities, such as during man-in-the-middle attacks. Watermarking – The final stage of video delivery is video playback on the video player. Any analog screen recorder can record this stream, and there is no effective way for a DRM (Digital Rights Management) technology to stop this. Viewer Specific Watermarking is a strong deterrent to screen recording videos, as viewers would be deterred from sharing content that has their IP address or contact details on it. There are numerous paid solutions in the market currently offering security for education providers. When evaluating DRMs for hosting your videos you should consider the above factors, and how the features offered by Online Video Platforms (OVPs) succeed in providing a complete solution. For example RTMP streaming is used by many companies for securing content, RTMP does not involve local storage of video data, and can be encrypted. However the process of backend authentication i s not completely secure, as toolkits such as RTMPDump can be used to give access to third-party applications. Here is a guide to implement variety of secure video hosting technologies for your site/app. Research done by T.Lucke et al is inconclusive about how effective flipped classroom method is in contributing to better performance. 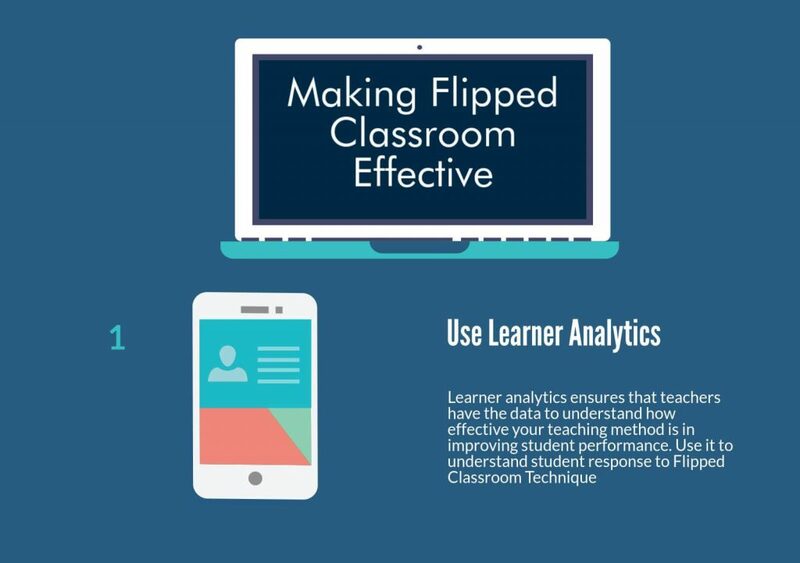 Flipped classroom videos need to be assisted by developing learner analytics, to better understand the effectiveness of the technique and what further steps may be taken for more effective and engaging learning. You can add video quizzes to learn how students engage with video. Results from student performance in the quizzes will be a good indication of how effective the videos are in communicating concepts to learners. Participating in quizzes in the flipped classroom video also contributes to knowledge retention. Students who have an understanding of a concept before class would engage more in the classroom, making for active classroom learning. Besides, teachers can incorporate surveys in the video, for feedback from students and also feedback from school administrators. Interactivity features can be implemented by adding an HTML5 pages within the video – most OVP (Online Video Platform) s can offer this functionality. 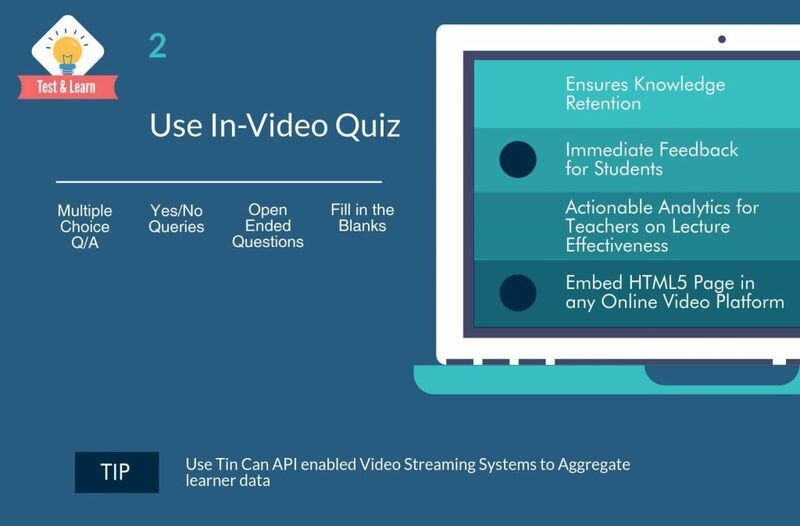 Analytics on students watching videos can be measured by integrating video player with Tin Can API. For custom video hosting solutions, support services are very important in ensuring smooth transition to using video hosting and in integrating with current IT systems. It is important to evaluate the support services that your OVP offers. Louis Deslauriers et al published findings from 850 Physics Undergrads at University of British Columbia, in which learners in the traditional classroom technology had an average score of 41%, whereas learners in the flipped classroom program had an average score of 74%. 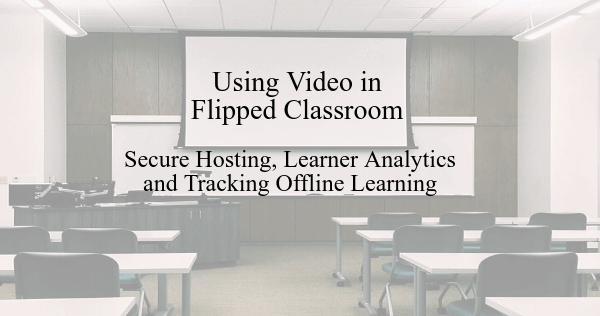 Videos are becoming increasingly important in aiding classroom teaching, and it is very important that you get your flipped classroom videos right! At VdoCipher we are committed to helping our users win the battle against piracy. Find more details about VdoCipher’s DRM infrastructure and our integration of Widevine DRM for Hollywood-grade security, which helps us protect our users’ premium content.